There is a new update in the ongoing saga between The Rock and Tyrese. Just last week we posted about the very public comments Fast and Furious star Tyrese Gibson made about Dwayne “The Rock” Johnson and how his upcoming spin-off film, Hobbs, is the reason the 9th installment in the series is being pushed back to 2020. Since then, Tyrese posted another scathing Instagram picture of the original cast and made more comments about how The Rock is tearing the Fast Family apart. There have been rumors of Fast spinoffs for quite a while now. Even Vin Diesel discussed wanting to expand the universe back in 2015, but it seems that The Rock may have been the only one to accept the offer if Tyrese’s accusations are true. “Brotherhood… and all it’s complexities. This scene was filmed in Puerto Rico, I can remember it like it was yesterday. Such a beautiful island, the people were so warm and welcoming. I turned 43 that summer… and my son Vincent was born. A woman named Jan Kelly responded to a question I had asked on Facebook, ‘who they would like to see me work with?’ She said would love to see me work with Dwayne… I listened to her request and he became Hobbs. As we plot the course to expand the Fast & Furious universe, one must be mindful to take stock of the roads we took to get here. The pillars of authenticity, family and most importantly, our loyal fan’s perspective has been instrumental in procuring success. However, like any vehicle that has run around the globe 8 times, the franchise is in need of maintenance. My good friend and the godfather of Universal, Ron Meyer has granted me the time to do just that. We have some very exciting news to share soon… stay tuned. The Rock has been relatively quiet until he released an update yesterday on his Instagram revealing that his Fate of the Furious co-star Jason Statham would be joining him in his solo endeavor. While not directly responding to Tyrese, he did comment on how he was excited that his solo film would open doors for other members of the Fast Family. He also used the hashtag #CandyAssesNeedNotApply, which he may be referring to Tyrese. 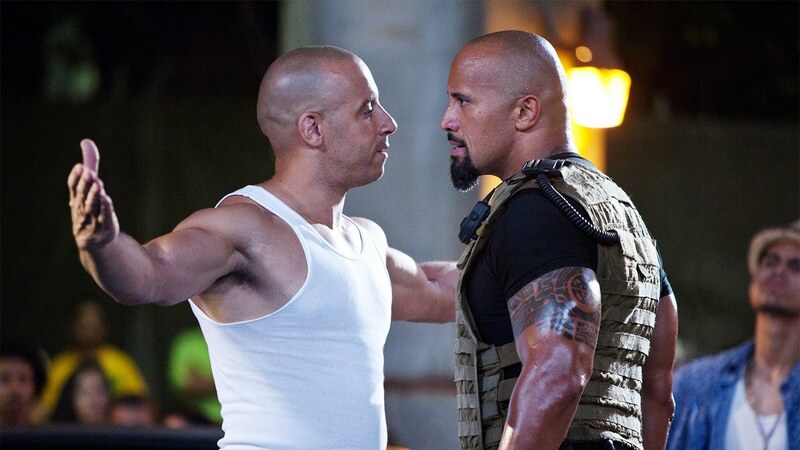 Now, if you remember last year there were rumors that there was beef between The Rock and Vin Diesel. The Rock posted a statement saying he was unhappy with his male costars and how they conducted themselves. While he did not mention anyone by name, he did refer to them as “Candy Asses.” The Rock’s hashtag might just be a subtle dig at Tyrese without fully referencing him by name. Since the news has come out, Tyrese has been quiet on the matter but has yet to take down his original post.